Good traders constantly try to improve their market participation performance. Lasting improvement is impossible without feedback from already executed trades. Whether the feedback comes from the same trader, analyzing previous trades or come from a coach or other, more experienced traders is independent in this view. Trading journals are created for the purpose of improvement and documentation. In each of our development levels as traders we might need a bit different format of journals, as we strive to improve different things during our development process. One of the tools, that we use in addition to trading journal is the Market Participation Chart or MPC. What do wee need to create an MPC chart? - We need the position opening time. - We need to show all trades, when we either increased or decreased the position size. The first picture below is about presenting Long trades in MPC. The most often executed trade is probably opening a fixed size position P1 at time T1 and closing the same P1 position at T2 time sometimes later. The next, a bit more complex trade, when we open a bigger (Say 100%) position at P1 at time T1 and first we close only part of the position at T2 to let the profit run more with the remaining position and close it sometimes later at T3. A bit more complex trade management showed as the third and fourth trade. We might use very complex strategies to build up and to tear down our positions, depending on market behavior. Different traders might have different favorites in different periods during their trading career. If someone is very good at selecting good entry points and according to some evaluation is not patient enough to let the profit run long enough, than the second scenario, when we close a portion of the trade might help to improve overall performance by helping to maintain better, more relaxed mental state during trade management. Big market players might cut their Long and Short positions into a lot of smaller positions to mask their intention in the market. Many other MPC strategies could be created and played in different market situations. To put this in real perspective we created an MPC on top of a real Chart, which contains a week of trading, using 15 minutes time-frame. The presented sample chart is drawn on the NASDAQ100 following ETF, the QQQQ. It is not optimal market play, but definitely shows some of the characteristics of the experienced trader. During this trading week we presented we could identify the strength and weaknesses. - The trader was able to hold the position long enough to bear fruit, especially in trending market..
- The trader did not hesitate to completely flip the direction of the trade, once evidence showed good reason to do that. - Even though many of the reasoning for the individual trades might not be presented on the chart, the goodness of the result easily could be evaluated. So If the reasoning during trading is not optimal, it will show up on these charts. 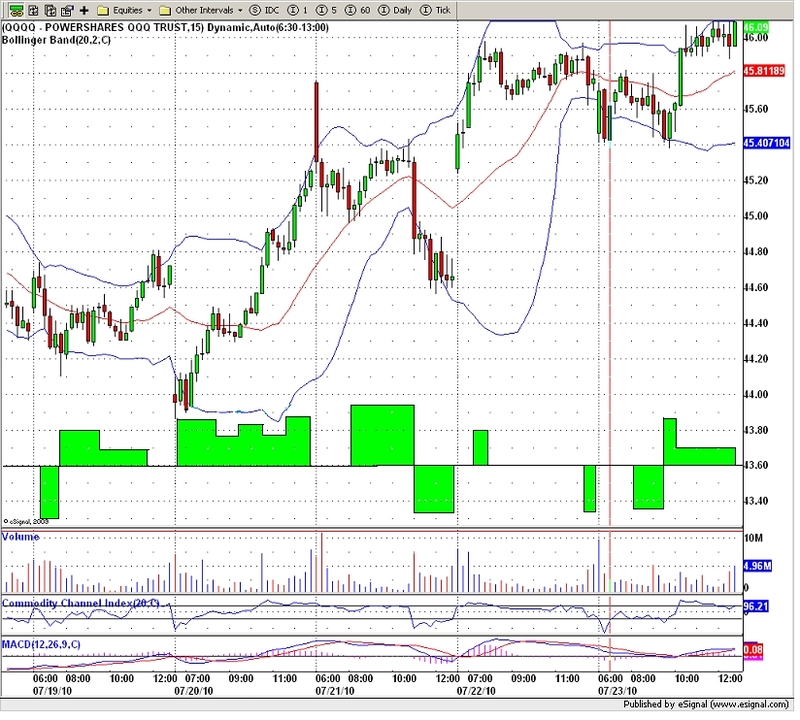 - On 07/19 afternoon the long trade was closed, instead of increasing the size earlier, when the uptrend became evident. - On 07 / 20, when the price moved out of a 45 minute range to the upside, the position size could have been increased massively, knowing that we had a Bullish daily prediction and the previous market close was way above current levels as potential profit target. - On 07 / 21 a short position could have been initiated after the BIG GAP UP recognizing when the down move attracted more and more participants, more and more down volume, knowing that resistance was deeply below current prices. - On 07 / 22 we could open a Long position midday, after getting the confirmation that the pullback was really only a pullback and not a reversal, but a potential move to test the previous intraday high did not present a really good risk / reward ratio. Indicators, that used in the decision making process could be added to this kind of charts. Even if we know that not necessarily all reasoning will be presented here. Since one picture can tell a million words, it contains much more information, than a simple trading journal. In addition to this we can write data into the trading journal and actually use that to create the picture. Since the trades and the trade management is demonstrated on one simple chart / picture it is very easy to interpret, compared to trading journals. It is hard to find a general trading journal, because different traders have different objectives and improvement ideas, which make it almost impossible for other trader to quickly judge the performance of another trader. A trading journal obviously does Not have information about missed opportunities. After a stressful trading period, in a weekend or after a month we can sit down and objectively evaluate all trades and all potential missed opportunities, that will show up on the chart, at least for the pro traders. The Market participation Chart is a good way to convey most trading information and it can be sent to others to ask the opinion of the pro trader about the executed trades and trade management. It can help to improve the performance of a trader community by discussing the same thing, using a generic way of presentation. Data like win loss ratio, Profit / Loss during the charted period could be added to the chart, so that these charts could be compared week after week or trading period after trading period. If the trades look the same but the profit is much less than other times on other MPC, than the reason could be that the Volatility or other aspects of the market changed and we did not adapted to that. Position or trade management is a very important topic, especially for the more advanced traders, who can benefit more from the application of the advanced methods than novice traders. MPC shows its real strength in this area.